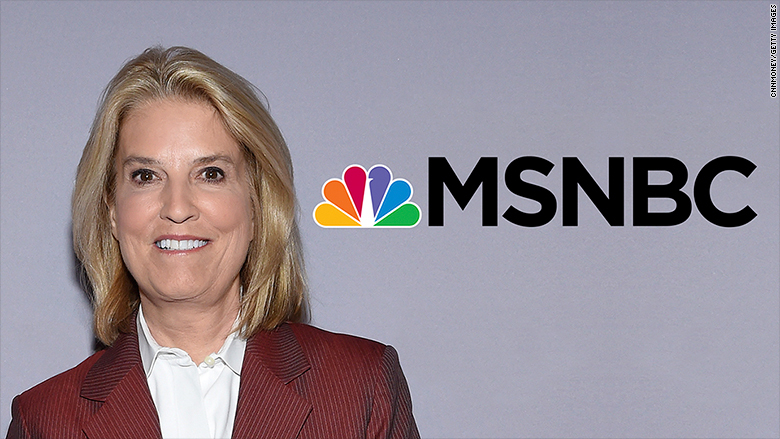 Longtime Fox News host Greta Van Susteren will join MSNBC as the host of a new early evening program, the channel announced Thursday. Van Susteren's 7 p.m. program on Fox was called "On The Record." Her new 6 p.m. program on MSNBC will be called "For The Record." Her first day on MSNBC will be Monday, January 9. Van Susteren will remain based in Washington, D.C. The content and format of the show will be similar to her Fox show, her husband, the lawyer John Coale, told CNNMoney. "Greta is a true pro with a proven record of tough journalism," MSNBC president Phil Griffin said in a statement. "Her broad range of experience and sharp news judgment will be of great value to MSNBC as we build on our momentum going into a new year and a new administration." Van Susteren's hiring is a bid to draw some of her Fox fan base and a way of replacing "With All Due Respect," the Bloomberg political talk show that MSNBC had been re-airing in 2016. The addition of Van Susteren had been rumored since late December. Van Susteren is completing a cable news trifecta: She was a well-known host and legal analyst on CNN before joining Fox News in 2002. At MSNBC, she'll be competing with Fox's "Special Report" program, anchored by Bret Baier, and CNN's "The Situation Room," anchored by Wolf Blitzer.